There are an awful lot of people who don't believe there is some being watching over them that cares deeply about them, and in particular what they do in their bedroom and with whom, but reject the label "atheist" because they feel like it implies something political or sociological. Or maybe they think Dawkins is a jerk or something. I view these people as de facto atheists with a semantics issue. ^Dawkins approach probably mostly backfires except with those already in his camp. Last edited by earthling on Sat Jun 02, 2018 4:52 pm, edited 1 time in total. 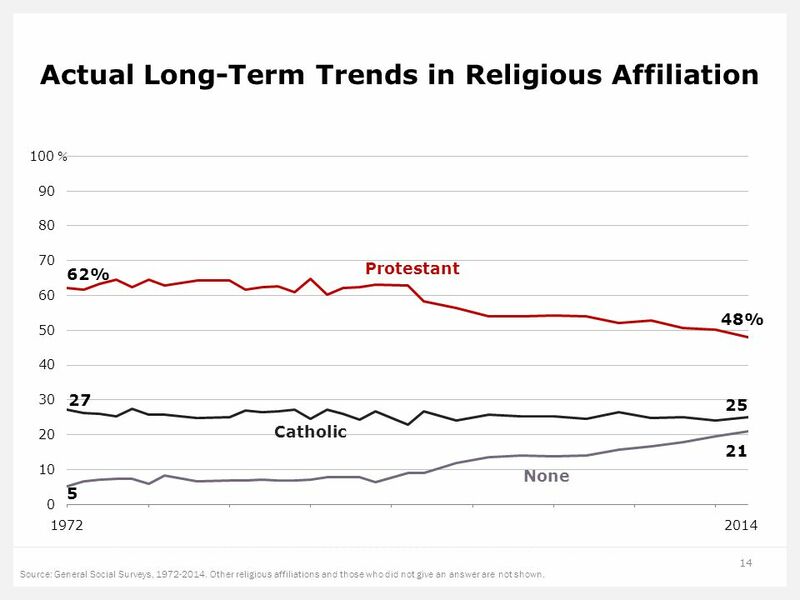 Protestant specific religion identity dropping from 50% to 30%, Catholics flat, "No religion" generally increasing, rising at a faster rate than altie protestants and may pass Catholics in a few years. Interesting trend in KC vs US. KC metro's unaffiliated apparently grows by 3 points in just two years while US grows by 2 points. Interesting to see STL stay same. Couldn't find newer stats on this stat but in 2014 this claims KC's largest group was White Evangelical but given growth in Unaffiliated, KC's largest group may be Unaffiliated by now at least according to how broken down by PRRI. Last edited by earthling on Mon Jun 04, 2018 11:21 am, edited 1 time in total. This is interesting, it has by age group and income too. The income chart is especially interesting. The less income you make the less likely you are to be unaffilated. While comes with a story. One guy I worked with is as solid Christian as you can imagine. I recall his father was a rural preacher. He was the guy you could have an honest, fair and non-hostile religious discussion with. One of his closest friends was learning Greek just to read the new testiment. He mentioned one time walking into some churches during college and feeling like he was looked down on based on what he was wearing. If you're lower income you're not walking into a church wearing a suit and slacks like you will see many boomers in. The very members of some churches are creating a class divide below which you don't feel welcome. This also connects to way more evangelical churches encourage people coming as they are. For them it was a smart cultural move and explains the growth of the movement. 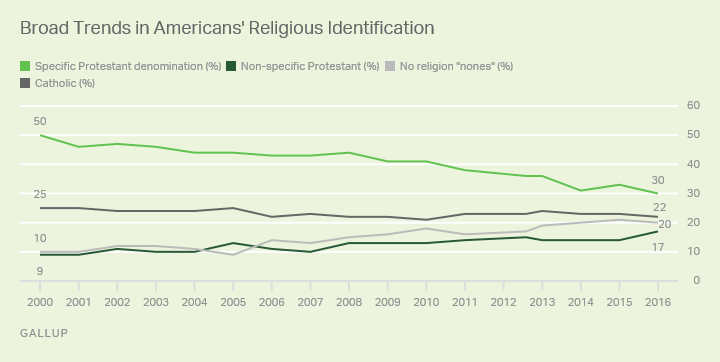 Evangelicals have attracted some mainline Protestants but appears to be in decline or flat overall with just about every source I've seen except when Evangelicals are the source. Northland KC seems to be unusually Evangelical and they can be rather religiously extroverted, but metro wide it's likely in decline like US, especially given KC (and US) appears to be rising rapidly with unaffiliated. Unaffiliated appears to lead with younger generations who are also just getting starting or not yet in job market, so relatively lower income, but seems the more educated a person is, less likely to be Christian. The only thing growing in US is Unaffiliated/Nones and Other (maybe mostly Muslim/Hindu via immigrants). They show 20% for None vs 25% for Unaffiliated by other sources but both growing significantly since 2000. The way the label is interpreted is probably the difference but still highest segment growth either way. Check out the "Do you believe in God" question, major increase lately in No. 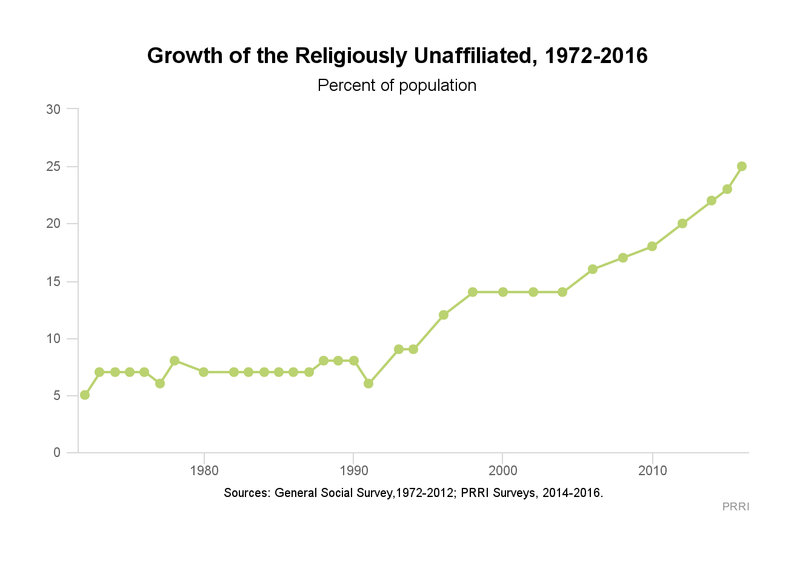 Any thoughts on why Nones/Unaffiliated growing so rapidly since 2000? Same trend in Europe too but even faster pace in several countries. This article is from a church viewpoint and it makes what is probably the most valid point, that churches stopped being churches. They claim 70% of regular child attendees quit after high school and only half return as adults. Too many churches tried to make going to church cool with bands and youth nights and camp rather than being a place to teach religion. So when these kids grew up and outgrew all these things their social club stopped being relevant in their life. A trendy church is preaching to a decreasing number of people as a result. Many trend the other direction. On several Sundays I ended up at the church we used to hold Cub Scouts at to get signatures. The church was being sold/merged and it didn't surprise me. They didn't have more than 30 people attend and 75% were over 60 and they were almost all wearing old fashioned suits. At age 13 would you want to be involved with a group that was all your grandparents? Too many priests have been immoral sexually and then try to preach on the subject? Imagine you're a 15 year old and one of your friends is gay. You've known them since age 8 and they're the person you trust the most in the world and now you're being told that they are worse than you for a reason you know they didn't choose to be? Imagine you're a 22-year-old former churchgoer and someone you know is trying to sell you to be "born again" and join their church. You find out they follow someone who resigned with disgrace over adultery. Why would you associate with someone who ignores such immorality? Too many churches became political. Many youth today are having problems getting jobs and making a strong financial life. They see their parents ruined over a medical bill or losing their union job. Meanwhile your church supports a specific political candidate that will cut health insurance and union jobs. Why would they associate with people that would promote a candidate that they perceive as making your life worse off? Is religion not a place any more that serves all people? Why would you associate with a group that wants money to send it's members to go on a mission to Africa when there's people in your own community they won't help? Today you don't see religious people standing on the corner politely offering help to people. You see people with bullhorns or signs saying everyone is going to Hell. There's also lack of basic availability as an institution. When a church has hours it's telling people that religion is only important certain hours. Many years back, about age 19 or 20, I needed to go into a church in Liberty for a reason I forget (needed to pick something up for family?). It was 3pm on a weekday, the kind of hours a college student is free between class and work. Not a single door was unlocked, I had to return later. Think about what it means for moral availability if the church is closed. You're going to go elsewhere to find help. Last edited by flyingember on Mon Jun 11, 2018 11:12 am, edited 1 time in total. I agree that one of the primary things that had turned a lot of people off is when religion got in bed with politicians instead of holding politicians to account with religious principles like taking care of the poor, seniors, sick, etc. The Catholic Church administration has done most of the damage to itself by protecting child molester priests, instead of children, and rampant financial corruption. The fact that there is also evidence the Church protected Nazis, and helped them escape Europe after WWII, doesn't help either. Because the Vatican is its' own state, it was able to issue passports. I'm not Catholic, but had I been raised a Catholic I would have left the church by now over these issues. I think Pope Francis is trying to move the Church in the right direction though. Last edited by FangKC on Wed Jun 13, 2018 12:33 am, edited 1 time in total. FangKC wrote: I'm not Catholic, but had I been raised a Catholic I would have left the church by now over these issues. In US politicizing religion might be a factor but that has happened in other periods, especially in the 1950s with borderline state sanctioned theism ('in God we trust' added to coins, 'one nation under God' added to pledge in 1950s) - no shifts away from religion then. Churches have their scandals but that also happened often throughout history w/out major shifts away from religion, usually just driving a change in religion not a shift away. Something is going on causing a major shift away from religion in just 20 years. Seems to be broader access to instant information (Internet) that reasonably conflicts with traditional explanations, broader understanding of nature (more knowledge gained in last 30 years than rest of humanity, DNA is a biggy), more options/explanations when dealing with needs that aren't being met and a higher % of people apparently value reason _over_ supernatural explanations (especially fewer Westerners treating them about equally relative to past). And more also call themselves 'spiritual' but not accepting religious explanations or concept of worship. It's easier now than ever to step outside the confines of learned culture as we globalize and share new reasonable information/explanations more rapidly. Seems religion will mostly only grow in countries/regions where it is imposed or still highly culturally expected to be followed. 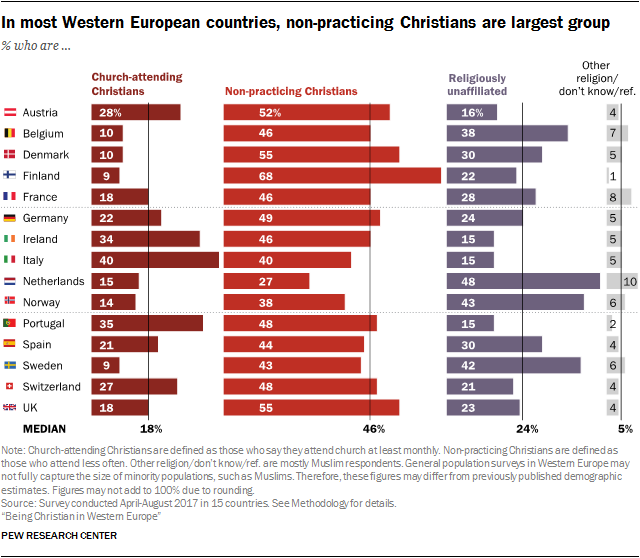 But even in remaining culturally religious European countries (Italy, Poland), it's ultimately still shrinking. Islam is expected to pass Christianity (globally) by end of century. Unaffiliated is currently #3 globally and outside Asia/Africa could pass Islam/Christianity too if the pace keeps up. But while more are shifting away, it does seem a higher % of religiously active are more extroverted/political about it compared to 20+ years ago, including in KC. Will it backfire? Has it already? 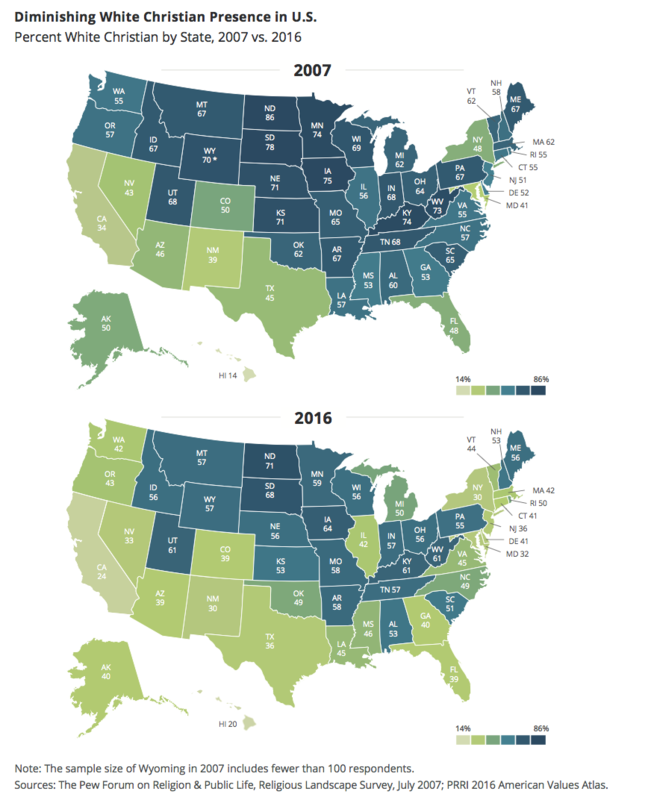 Non-religious in US jumped to 29% in 2017 according to Pew, was 25% in 2016. It's probably 25%-30% depending on how defined but generally up from low 20s earlier this decade and low teens last decade. That is astoundingly fast rise considering history of US has been typically below 10%. This is saying that people who actively practice are a minority, even including people who claim traditional beliefs. Groups you could call traditional Christian, going to church and such, falls under 29%. -White Christians now account for fewer than half of the public. Today, only 43% of Americans identify as white and Christian, and only 30% as white and Protestant. In 1976, roughly eight in ten (81%) Americans identified as white and identified with a Christian denomination, and a majority (55%) were white Protestants. -White evangelical Protestants are in decline—along with white mainline Protestants and white Catholics. 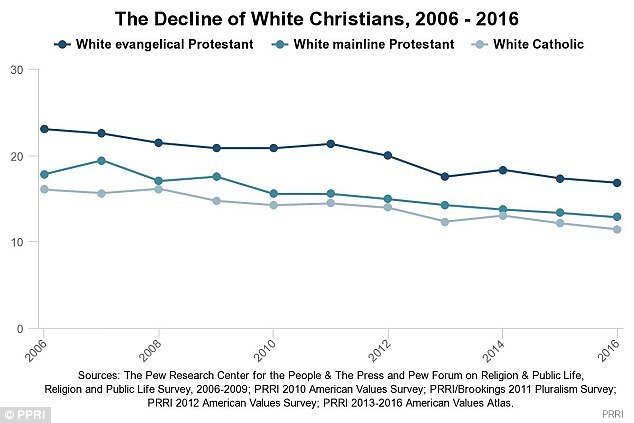 White evangelical Protestants were once thought to be bucking a longer trend, but over the past decade their numbers have dropped substantially. Fewer than one in five (17%) Americans are white evangelical Protestant, but they accounted for nearly one-quarter (23%) in 2006. Over the same period, white Catholics dropped five percentage points from 16% to 11%, as have white mainline Protestants, from 18% to 13%. -The Catholic Church is experiencing an ethnic transformation. Twenty-five years ago, nearly nine in ten (87%) Catholics were white, non-Hispanic, compared to 55% today. Fewer than four in ten (36%) Catholics under the age of 30 are white, non-Hispanic; 52% are Hispanic. -There are 20 states in which no religious group comprises a greater share of residents than the religiously unaffiliated. These states tend to be more concentrated in the Western U.S., although they include a couple of New England states, as well. More than four in ten (41%) residents of Vermont and approximately one-third of Americans in Oregon (36%), Washington (35%), Hawaii (34%), Colorado (33%), and New Hampshire (33%) are religiously unaffiliated. 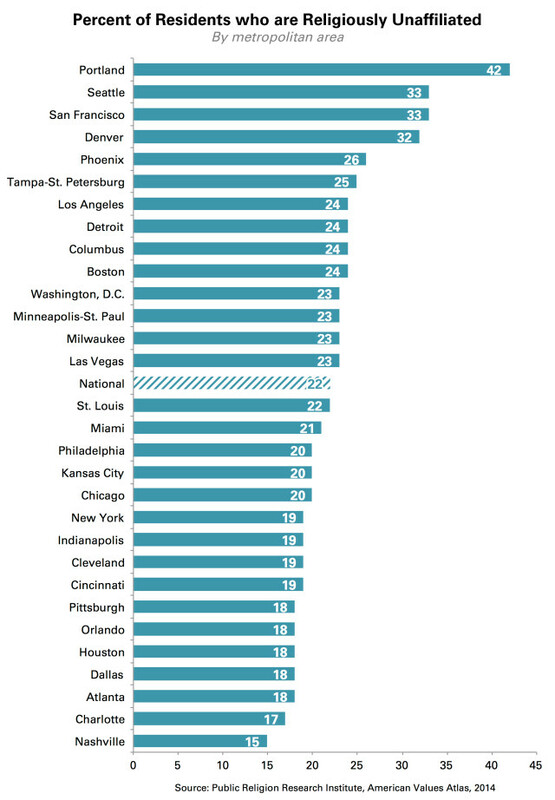 -No state is less religiously diverse than Mississippi. The state is heavily Protestant and dominated by a single denomination: Baptist. Six in ten (60%) Protestants in Mississippi are Baptist. 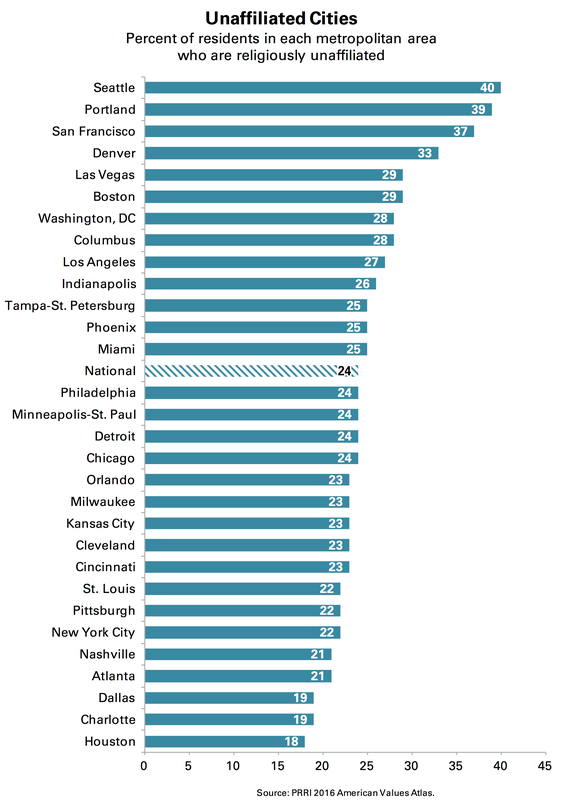 No state has a greater degree of religious diversity than New York. -Jews, Hindus, and Unitarian-Universalists stand out as the most educated groups in the American religious landscape. More than one-third of Jews (34%), Hindus (38%), and Unitarian-Universalists (43%) hold post-graduate degrees. Notably, Muslims are significantly more likely than white evangelical Protestants to have at least a four-year college degree (33% vs. 25%, respectively). -Asian or Pacific-Islander Americans have a significantly different religious profile than other racial or ethnic groups. There are as many Asian or Pacific-Islander Americans affiliated with non-Christian religions as with Christian religious groups. And one-third (34%) are religiously unaffiliated. -Nearly half of LGBT Americans are religiously unaffiliated. Nearly half (46%) of Americans who identify as lesbian, gay, bisexual, or transgender (LGBT) are religiously unaffiliated. This is roughly twice the number of Americans overall (24%) who are religiously unaffiliated. -White Christians have become a minority in the Democratic Party. Fewer than one in three (29%) Democrats today are white Christian, compared to half (50%) one decade earlier. Only 14% of young Democrats (age 18 to 29) identify as white Christian. 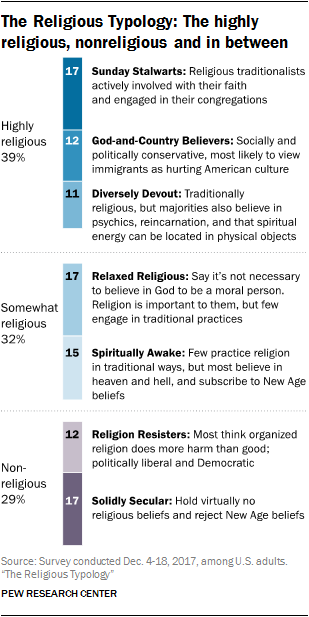 Forty percent identify as religiously unaffiliated. -White evangelical Protestants remain the dominant religious force in the GOP. More than one-third (35%) of all Republicans identify as white evangelical Protestant, a proportion that has remained roughly stable over the past decade. Roughly three-quarters (73%) of Republicans belong to a white Christian religious group. What is funny is the two current party leaders of the House, Ryan and Pelosi, are Roman Catholics. And yet many of their political views are quite opposite. With regards to the Supreme Court currently there are 5 Roman Catholics (Roberts, Alito, Thomas, Sotomayer and Kavanaugh), 3 Jews (Breyer, Ginsburg and Kagan), and one who could be either Roman Catholic or Episcopalian (Neil Gorsuch born and raised in Catholic Church but married an Episcopalian and is currently registered in an Episcopalian church). Also Clarence Thomas was raised as a Catholic but went to an Episcopalian church but went back to the Catholic faith. Just wonder how their religious background and beliefs affect how they conduct themselves in practice?